Qualcomm which powers millions of Smartphones across the globe, and today the company has launched a new processor and that is called Qualcomm Snapdragon 712 SoC. The new processor is a successor of Qualcomm Snapdragon 710 which was launched in last year. The new chipset is coming with lots of improvements and it is meant for the mid-range as well as premium category smartphones. So, without any delay let’s dive into the article to check out all the details of the newly launched Snapdragon 712 SoC. The all new Snapdragon 712 is octa-core architecture based on the Kryo 360 cores which is same to its predecessor and clocked at a 2.3GHz and it is coming with the fast charging standard, as the Snapdragon 712 supports Quick Charge 4+ that is claimed to charge up the battery from 0 to 50 percent in as little as 15 minutes. The company claims that the new Snapdragon 712 is capable to offer a console-level gaming experience and a more immersive multimedia consumption experience, and the company has improved colour rendering and audio output. Speaking about the imaging capability, it has Spectra 250 ISP that has support for up to 20-megapixel dual cameras or a single 32-megapixel single camera, and also supports 4K video capture at 30fps and full-HD video recording at 120fps. Moreover, it also has the support for 4K Ultra HD video playback on an HDR 10-supported display with a maximum resolution of QHD+. Qualcomm Aqstic audio technology handles the audio department and is further backed by Qualcomm aptX for more refined music playback over wireless headphones. 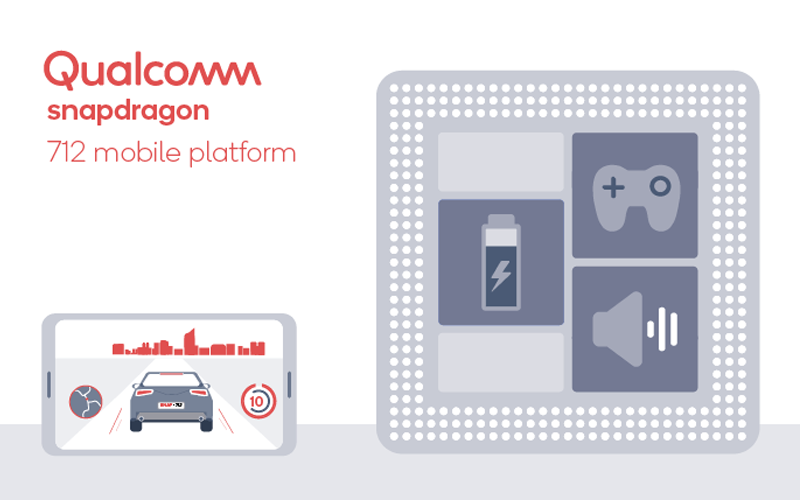 The Snapdragon 712 also powered with the Qualcomm AI engine which is claimed to automatically adjust UI preferences based on usage pattern to help in scenarios like clicking images or shooting videos. It also supports Bluetooth 5.0 and tri-band Wi-Fi for wireless connectivity, and the new processor utilizes the Snapdragon X15 LTE modem which facilitates fast download speed of up to 800Mbps over Cat. 15 LTE standard and uplink speed of up to 150Mbps over Cat. 13 LTE connectivity.